← What’s Your Princeton WalkScore?? The architect, planner and wind-bell manufacturer, Paolo Soleri, died last week at the age of 93. The New York Times, who call him ‘the architect of counterculture’ has this report of his life. You can find another great obituary (with many pictures of his work) at azcentral.com here. Of course, in 1950s America, the problems with sprawl had not yet become obvious. The paving of hundreds of square miles of farmland to create car-dependent sub-divisions, endless traffic, smog and climate change had yet to be brought to their logical conclusion. Soleri proposed a different approach, aiming to build an entire city where everything was walkable. Taking his cues from nature, he invented a fusion of architecture and ecology, which he called ‘arcology’, and set about building an entirely autonomous city in the high desert of Arizona north of Phoenix. This project, which became the Arosanti development, still exists to this day. 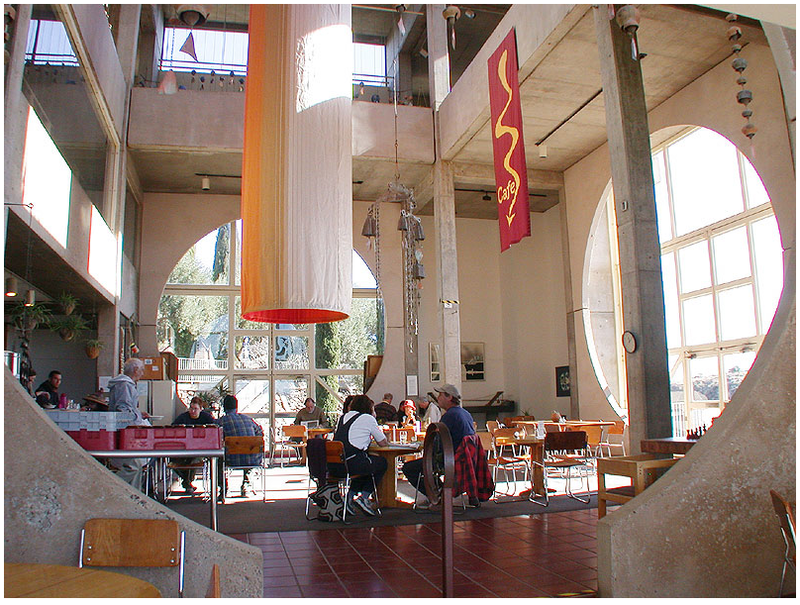 Those of us who have visited Arcosanti find intriguing architectural elements based on organic forms, the use of passive heating and cooling systems, and a way of life that fuses the architecture studio with a hippie commune. Incredibly, much of this development was funded by the sale of wind-bells, which Soleri cast in his own hand-built foundry (find the whole catalogue here). Although many of Soleri’s ideas have been ridiculed as utopian, his recognition that compact cities with green design was the way of the future is now being seen as visionary. As young people flock to walkable downtown areas and compact ‘town center’-style developments spring up in the suburbs, Soleri lived long enough to see the tide turn in favor of compact walkable development. His contribution will be remembered by a generation of architects influenced by his principles, and by those of us who favor walkability instead of sprawl. This entry was posted in Sustainability, Zoning. Bookmark the permalink.